Highly regarded for spiritual applications, used for vibrational work and clearing negativity. 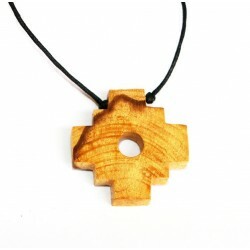 Our fragrant Palo Santo pendant is beautiful hand crafted and very aromatic. The pendant come with a necklace. This aromatic wood belongs to the same family as frankincense and myrrh. Used for common cold & flu, asthma, allergies, migraines, headache. Great to relieve stress, anxiety and depression. Also as an anti-inflammatory & anti-bacterial. Insect repellent. Possible use for coughs, bronchitis and other respiratory ailments. Highly regarded for spiritual applications, used for vibrational work and clearing negativity. It is energetically cleansing & healing, with properties similar to sage. It cleans and help to remove the bad energy from the home, keep away evil spirits, induces meditation and spiritual search. The scent of Palo Santo is extremely soothing and transmits a powerful energy, hence the name "Santo". It is rich in terpenes such as limonene and α-terpineol.